NOT for North American Clients - ONLY International. 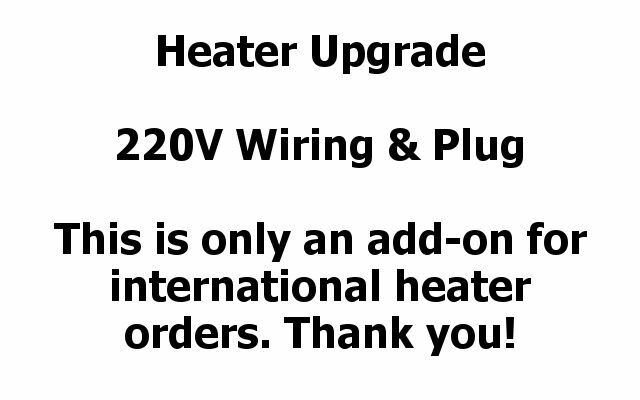 If your country uses 220V wiring, you must either select this option OR locate a transformer to use this heater. 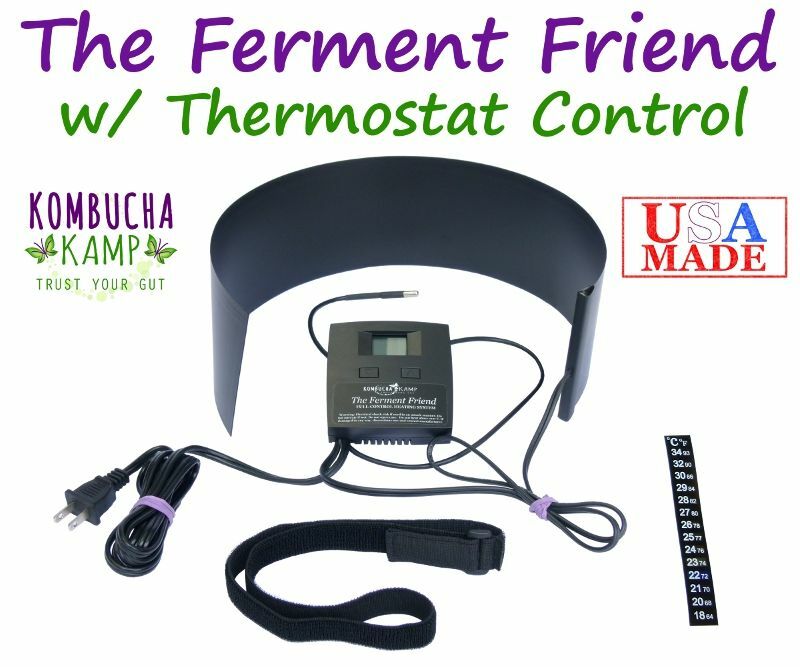 The Kombucha Mamma Essential Heating Strip was designed by Kombucha Kamp with the help of a thermodynamics engineer. Designed for all types of ferments, the state of the art ultra-thin construction & patented heating technology makes for more uniform heat distribution. Wrap around one vessel or lay behind several vessels to keep them all warm. This is a powerful little mat but is also very safe to use. I recommend using it on the sides of the vessel rather than underneath so that the yeast isn't over stimulated. Move it closer to or further away from the vessel to increase or decrease the heat provided, or keep only a portion of the heater in contact with the vessel to regulate. What Temperature is Recommended for a Genuine Kombucha Brew? Need more control from your heating solution? This heater can be specially wired for 220V systems for an upcharge of $35 by selecting the checkbox prior to adding to cart. I am very pleased with the heater(basic) that I ordered!It does a great job heating my brew and I now have fizzy kombucha for the first time in a year! I really debated about purchasing a heater since this was my first batch but after reading all of the helpful info Hannah provides and all the reviews, I decided to go ahead and get one. I am so glad I did. My first batch turned out perfect! My hubby and kids think it is better than store-bought! The heater was easy to regulate, I just moved it away from the vessel slightly if it got too warm and snugged it back around if it cooled down a little. We experienced 0 degree temps during the brewing cycle and we still had our first batch completed in 14 days! I purchased the heating strip. In my opinion it is a must have. Set temp at 78 at let it go - it works fantastic!!!! So winters here are rough and I like to keep my home cool, so brewing kombucha has not been easy. I decided to buy this heating strip because of the great design and the durability. It heats up very warm; I have four one gallons of kombucha going and they're all being warmed by this strip. If anything, I wish the strip was a little wider. I am happy with the length though. Kombucha Kamp you are great! Keep up the good work! I’ve been using my heating strip for the past month because it has already started to get chilly in Chicago. So far it’s been keeping my kombucha warm and at a good brewing temperature, although I'm still trying to figure out how close or far I need to keep it from my vessel to maintain that temperature. If you watched their video about the heating strip, please note that the strip you receive is much smaller than what's featured in the video. I didn't pay attention to the dimensions when I bought it (that’s on me) and when my strip arrived I was very surprised with the size. But like I said it seems to be keeping my kombucha at a good brewing temperature. My only complaint is with the amount of plastic packaging that the strip was shipped in. I hope they find a more eco-friendly way to ship their items. I love that this product is made in the USA and that I’m supporting a small business rather than just buying off of Amazon. It is pricey, but if you don’t mind spending a bit more for quality than I think it’s worth it. I’m a first time brewer and this is the only heating device I’ve used so I’m not sure how it compares to other products. From KKamp: Thank you for your feedback and support! As listed, the heat mats have been IMPROVED to be more efficient, therefore a smaller size delivers the same heat. :) In regards to plastic, we try to limit as much as possible but we must ship electrical components in plastic so they are unharmed in transit. We sincerely appreciate your support of our small family business! The heat strip is a must-have. When the temperature dropped this summer for several days, I knew I would be in trouble if I didn't heat the brew. So I invested in the Essential Heat Strip and I am very pleased with the simplicity of use. I keep my Scoby hotel nestled in with the 1 gallon brew and so far everyone is happy! Thank you Hannah! My Kombucha loves this heating system and I love my Kombucha. Thanks Hannah. Had my first heater go out within a month. Called Kombucha Kamp and they replaced it right away. Thanks guys for the fast service. New heater has been working well for 3 months now. This heater with the temperature strip makes it easy to keep my jars the correct temp. I use 2 1-gallon jars with the heater and a towel around them. I never have to worry about the brew being too cold or hot any time of year. Got this heater for 1 gallon brews. Does the job in cold weather although you have to adjust how close it resides to the booch container to maintain the desired temperature. I was so happy with my brew I decided to brew some Jun, so I had to purchase another heating element, I continue to be a happy customer with perfect Jun product! 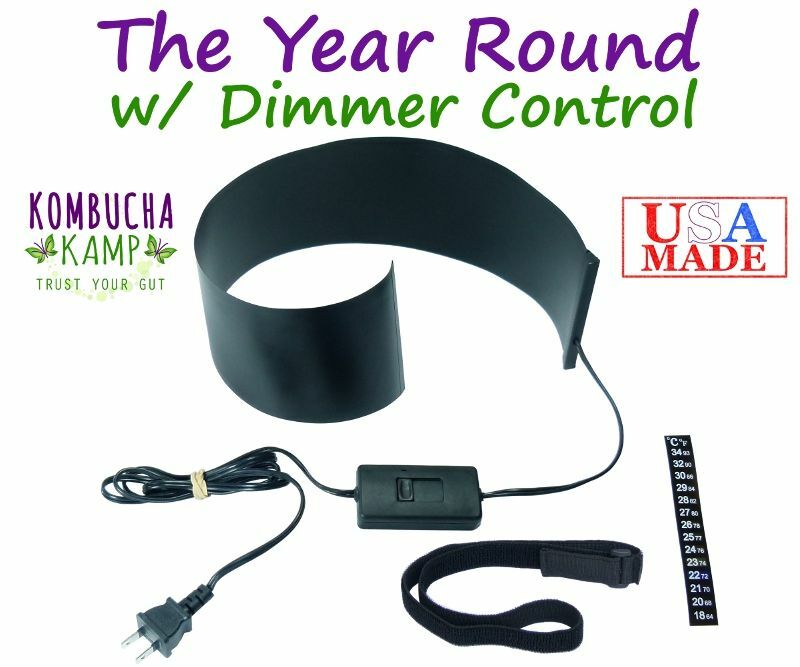 I ordered The Kombucha Mamma Essential Heating Strip on 1/25/18. I would like to give this item 5 stars. I had originally attempted to be cheap and purchased a heater online that was originally meant to be a heat pad for plants, but could also be used for fermentation. I keep my house fairly cool, especially in the evenings (around 58 degrees Fahrenheit) and my poor kombucha was getting much too cool to stay in the correct brewing range. Since purchasing the Essential Heating Strip form Kombucha Kamp, I have been shocked to see how nice and warm by 2.5 gallon brew has been staying--between 82-84 degrees Fahrenheit, even during the chilly Iowa winter. Needless to say, I returned my old heater and would not trade this heater for the world. If you have a cooler house, don't mess around with alternatives--buy the Kombucha Kamp heaters! My girlfriend and I LOVE the heater strip! Initially, I was slightly concerned that it would be fragile, since it is so thin. However, after opening and using it a couple times, I still treat it with care but do not fear it will start to break down so easily. The heat is gentle, and the heater is very easy to manipulate simply by moving it closer or farther away from the brewing vessel. If your brew is not where you want it to be and you suspect temperature to be the culprit, look no further! Hey this heater is awesome! My first heater was a dud but they replaced it at no charge and the new one works like a charm! I am currently brewing my 51st batch of Kombucha that is lovingly kept warm with the heat strip that I purchased from you. My loft is notoriously cold, and I couldn't make my "booch" without it. Very happy with this product. Also thank you Kombucha Mama for standing behind her products. Had a minor issue after a few weeks, product was replaced immediately and has been working ever since. Great company to do business with and great products! I've had the heating strip for about a year now. My house is never warm enough in the winter for kombucha. I have 4 gallons brewing in the cabinet above my fridge and the strip is between them. It keeps them at the perfect temperature. Along with my kit, I bought the simple Essential Heating Strip to maintain the correct temperature and it also works perfectly. I have been able to maintain a brew temp right around 80F without difficulty. I have been checking and logging the temperature daily and if the temp gets to 84F I just loosen the strip and if it falls below 80F I just snug the strip a little tighter. I'm very pleased with the heater strip and thermometer. Easy to set up and it takes very little oversight on my part to keep the brew at a great temp. Like everything else I have purchased from KK, I'm very pleased and their customer service is far above others. I purchased the heating mats for my kombucha jars. I finally have bubbles as the temperature was too cold for my tea to ferment! Total game changer! Cold winter, warm kombucha. Love this heating strip. Heater works great. Keeps the vessel temp around 80 -82F in the winter months and the bucha seems happy. The temp scale strips are accurate as well. This heating strip has worked wonders for my scoby! I am so pleased with it and glad I finally ordered one. PERFECT! Works wonderfully-just as promised. I looked at cheaper heating belts -but the reviews were sketchy. You get what you pay for, and if you want to leave the house-invest in something you don't have to worry about! I live in the Northeast and this heater makes it possible for me to brew kombucha all year long without a worry. I set my first ferment in the corner with this heater pad and leave it for 10 days.....it doesn't matter what the season, this heater does the trick. No worries with this heater, worth every penny. Thanks again Kombucha Mama!!! Living in Southern CA the temperatures drop at night requiring a little warmth for my stainless steel brewer. The strip is easy to use and has been a perfect addition to my system. Thanks Kombucha Kamp for meeting all my needs in one place. Shipping has been quick and reliable. When I hear friends say that they cannot get their kombucha where they like it I immediately think of asking if they are at the right temperature on a consistent basis. This heater is essential for keeping the brew at the correct temperature. Even in the summer our home is not warm enough to keep the brew at 80 degrees all the time! I love the fact that I just put it in place, plug it in and set the goal temperature for my 2.5 Gal brewer. It's always the right temp now and the brew is delicious! I did purchase the Deluxe set up and now that I am brewing with such ease, I am glad I did! Love it! I love the heat mat strip. It makes brewing so much easier. I use it year round. That way no matter the temperature in the house my brew is perfect. I ordered the one that I could set the temperature and not worry about it. So simple but a super important tool in brewing perfect kombucha. Thank you! I give Kombucha Kamp 5 stars. I ordered a heat mat for my brews in winter, my house is not warm enuff then and I know the mat will be a wonderful addition. I was using heating pads, but they go off all the time and are not meant for that and may not be safe to use the way I was using them. With the heat mat I know it is safe, it was made for this purpose. I have had a few questions, and have emailed Kombucha Kamp and they answer with the info. I will not buy these products from any other company, Kombucha Kamp is the best and they are jun and kombucha people, not just someone sitting in an office behind a desk giving info they know nothing about. Started brewing for the first time this January. My old house is on the cool side so I gave this a try. So glad I did! Easy to use and gets the job done. I guess I'm addicted because I bought a second one! I have my batches staggered a week or so apart. I'm glad to have the Essential Heating Mat accessory as when the wood burning season is over is over in downeast Maine, the mornings and evenings are cool. I'm looking forward to expanding from a single batch method to a continuous brew that I can share with guests of Light Heart Retreat. Additionally, as the health benefits are so many, I want to make drinking Kombucha a lifelong habit. Thank you Hannah for your commitment to excellent products, service and your commitment to education. I am new to brewing kombucha having gotten a starter kit from my daughter for Christmas, including a scoby from her batch. But I didn't have success brewing the first handful of batches. I found out my brew wasn't warm enough because we keep our house cool in the wintertime. I bought a heating strip through Kombucha Kamp and it works beautifully. Works great, it is a very gentle heat but keeps the brew at a good mid range temp. We also purchased the YEAR ROUND (one with temp control) and the FERMENT FRIEND (Set it and forget it unit). They all work great, for different configurations of brewing. My preference is the FERMENT FRIEND, the scoby it produces is BEAUTIFUL and the brew is very tasty. Works Great. I keep the house pretty cool in the winter, and this heater keeps My kombucha at about a constant 80 degrees. Had to put a layer between heater and vessel. I really like my products! The heating strip is really helping to keep the brew bubbling right along and Mama Scoby (as we call them in our house) happy 😁😁😁 I didn't realize a temperature strip would be included with the heating strip, so that's a bonus! I purchased The Essential heating strip after we moved to a colder climate and detected mold on our scoby for the first time in 10 years. After consulting my Big Book of Kombucha. I quickly found the culprit was temperature. After setting up the Essential Heating strip along the back of three, 2 gallon jars I'm back in business! I have recently purchased an essential heat mat and the model with thermostat. They are both easy to use and both work great! Very pleased with the results. My brews are staying consistently between 82 - 86 degrees-- which seems to be best in our home. This heating strip is perfect for our chilly house during the winter. Based on the different flavor profiles I've gotten, I've been able to adjust it adequately as the house warms and cools simply by adding or removing airspace between the heater and the side of my continuous brewing vessel. Simple to use. The fewer bells and whistles, the fewer things that can break. Great heater! I live in snowy MA and we keep our house at 65 so I realized I had to buy this heating strip after my first batch took a loooong to brew. I am now on my third batch and the heating strip makes all the difference. Thanks Kombucha Mamma! Great little mat. Needed something to keep my brew at a consistent temp during winter. This thing rocks. It's obviously homemade but great quality. I use it to keep two gallons brewing and it's perfect. I was gifted a kombucha set for Christmas and although I had heard of it, I had never even tried it before. So naturally I combed the internet for information and came across Hannah's website. It proved to be very helpful as I set up for my first brewing. As noted in many reviews, a constant heat source is basically essential for successful brewing so I went ahead and bought the essential heating strip. I didn't want to spend a lot for the more expensive ones because I didn't even know if I would like the taste. Happy to say that I do indeed love kombucha and the heating strip worked wonderfully. I am currently brewing in a one gallon glass jar that I knitted a wool cozy for and have the heating strip surrounding the jar held in place with a few quart jars. This arrangement keeps the temps an even 80 degrees for me. Thank you Hannah for all of your help in answering all of my many questions as I began this new adventure into the world of kombucha. My second brew should be ready in just a few days. I can't wait!!! I've been brewing my own kombucha for 2 years. Anytime I had a question I went to kombucha kamp website. I also purchased a heater from Hannah's company so I could successfully brew in the winter time. As I branch out I will order more items. Good job Hannah, I appreciate your hard work! This strip makes it possible for me to brew kombucha here in Arkansas during the winter. My first batch took 21 days to brew. Second batch with heater was ready in 8 days. Great product! I am using the oak barrel to brew my first batch of kombucha. I was not sure how well this heater would work with the oak - but so far, so good! My first batch is progressing great, with good scoby formation, even though its winter and my home is in the low 60s. one heating strip loosely around one gallon and three half gallons plus a quart of water kefir keeps everything nicely around 78 degrees. I put a towel behind the heating strip also. It was evident that as soon as the weather turned a bit colder here (NJ) the temp on my continuous brew went down. I tried thinking of places I could move the brew, but couldn't come up with anything that would really help. The answer was a heating strip. Bingo - within the first day I was able to regulate the temperature to 78*. I'm brewing fresh Booch in about 3-4 days. Very nice. Extremely satisfied with the purchase. Actually, thinking of setting up another CB. I brew in two, one-gallon jars. This strip is WoDerFuLL!! My cool San Francisco location makes it impossible to maintain even 68° - - until now! I use one strip. It keeps the space I have for my brew at 84°, while the jars are at 88-90. Thanks for doing what you do - and doing it so well. Game changer! I am thrilled to have found the Essential Heating Strip. Last winter was the pits - it took 2 weeks for my kombucha to brew and I spent HUNDREDS of dollars buying from the store to fill the gaps. I was so excited to purchase one this fall and it has delivered. Now I get to bottle every week! It was totally worth the investment and is keeping my scoby and wallet happy. Thanks Kombucha Kamp for solving this problem!! The smaller heating belt works great, will see if it can keep up with colder temps this winter, so far so good! Thank you for all your great products & service! I love this heating system. I've been using it for one month now, and no problems electrically. It has not become winter yet where I live, but so far this heater does the job of keeping my kombucha in the happy range. I simply check the thermometer every day to assure it is i. The proper range- if too hot/cold, I adjust the belt closer/farther from the jar! Thank you! My brews always took so long to ferment during the winter months but the heat strip has solved that problem. Wrapping it around the bottles keeps them from dipping too low and each batch is ready much quicker. Great idea, thanks for supplying everything needed to be a successful Kombucha maker. The essential heat strip has been extremely important for keeping my kombucha brew at the perfect temperature for fermenting. I just leave the heat strip below the continuous brew system and check on it everyday or so to make sure the temperature is in the correct range. So far I haven't had it be too cool or too warm. It has definitely increased the speed of the first fermentation. I broke down and ordered this after putting a 60 watt heat light on my first batch. Because of the light I had to cover jar with a towel, very inconvenient to see what was going on. Also the wattage on this belt is so much lower than my light. I am on my second batch with this heat belt. It is working very well. I am glad I got this one instead of the dimmer type. BOTh have to be monitored for temperature, and you can easily adjust the amount of heat going to jar by placing a rolled wash cloth or tea towel between the jar and belt. Also I did not remove backing to place thermometer on jar as I run them through the dishwasher after each batch. I just secure the thermometer with a large rubber band, works great. I have two Essential heating strips and just ordered another today. They are so versatile for keeping pretty anything warm. Highly effective in my cool house. The strips have lasted for sometime and they are always in use. I love that I can snake the strip between vessels or bottles which enables one to warm sever things at once. They are long lasting and durable. I purchased my third one today, because I have more cultures to keep warm. This is a must have item if you live in a cool climate or if your house is chilly like mine. As I said I have had them plugged in for about a year and a half and they still keep my fermentations warm. An awesome product designed perfectly. This is everything I wanted to complete my continuos brew set up. Between this and all the wonderful advice from Hannah I am becoming a Booch master! Thank-you! I am very happy with this heater. It gives me just enough heat for my brew in the winter months. I'd like to give a 5 star review for both my SCOBY and the heating strip. After I got my heating strip, my booch stays at a perfect 75-85 degrees and is brewing a lot faster. So happy with both! Yes a heating pad works but it's tacky looking and doesn't belong in my kitchen so this heating strip is perfect especially for Continuous Brewing as it fits around the crock nicely and the cord is long enough but not too long. I just love it! Worth every penny! This heating strip has really helped my brewing along. I didn't realize that a warmer temperature was needed since I am new to brewing. It really does make a difference! I am so glad I purchased the heating strip. Even though I live in Florida, I keep my home somewhat cool. The booch is happy and bubbly and it seems to take less time to get to the right taste! :). Thanks Kombucha Mamma! I greatly enjoy a heating system for my home Kombucha brewing process. I live in Virginia state and weather here is normally warm, however as the fall and winter approaches, temperatures in the house are around 70F which seems too cold for fermentation. Heating system helps to increase the temperature in the brewing jar and speed up the fermentation. The heating system is neatly made and exactly the size of my 2 gallon jar. 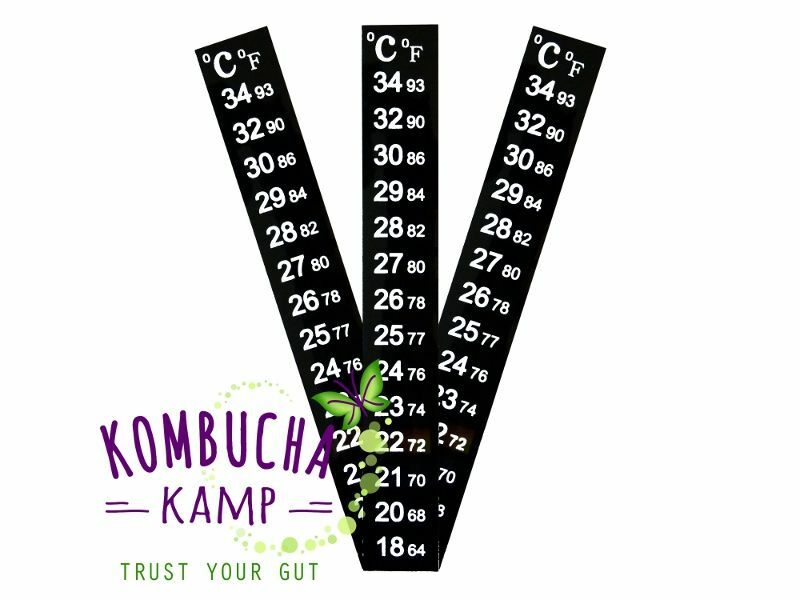 The kit that you receive from Kombucha Kamp includes a temperature strip that measures temperature in the brewing jar. This is very helpful and takes guessing out that you are not boiling your SCOBY! I really appreciate this easy to use, flexible heating strip. Love the way it wraps around my gallon jars keeping them just at the right temperature. I purchased all three types that Hannah sells & have used this one & the one with the thermostat so far. This one is around my coffee kombucha gallon along side another experimental gallon. The Ferment Friend is around my continuous. brew. Hannah explains how you can use this heat wrap around 4 gallons...so clever. Great Job Hannah. I give this product a 5 star rating. This makes the heating process real easy. 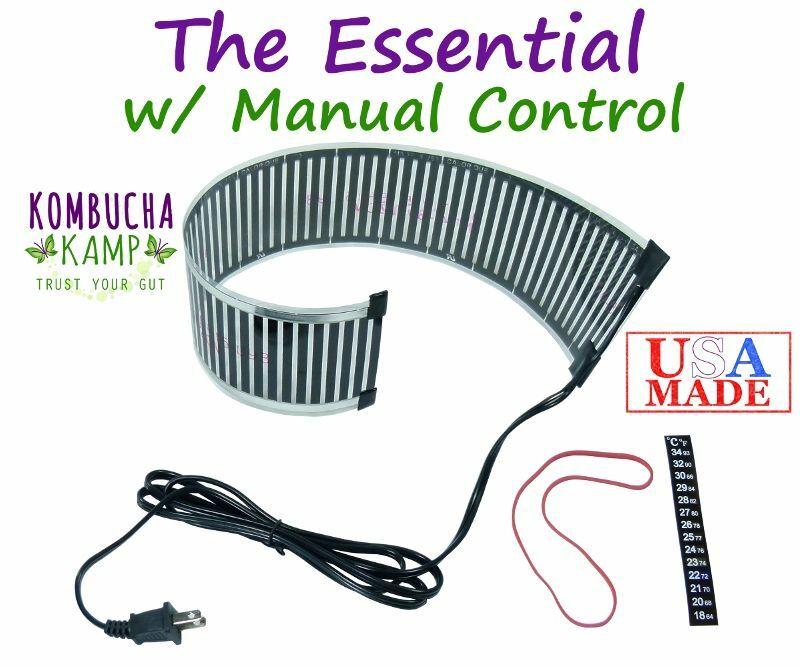 I purchased the Kombucha Mamma Essential Heating Strip. What a great purchase I highly recommend it to anyone having difficulty with attaining a constant temperature. I rate this product at 5 stars. I bought the heater strip when I purchased my continuous brew. I am so happy I did as I live in VT & winters are very cold. The heating strip keeps my kombucha at an even 80-82 degrees, perfect for my brew. I can set it & forget it. Wouldn't be without it! My Scoby is soo happy now. No more chilly nights to slow it's action down! I live in coastal Northern California and it is common in summer to have 40 something to 50 something nights after an 80 something or 90 something day. I love waking up to see Scoby is still cozy. I plan to purchase another heater for my second brew vessel before the temperatures turn cold again. The Heater is so versatile. When the room temperature is cooler but not really cold it is easy to keep two Scoby's happy. I am quite impressed by the quality and cost. Thanks for doing such a great thing for us who love KT. All hail Kombucha Momma! My first two batches of Kombucha were not successful, and I was about to give up, but ran across Hannah's fabulous website and products. I purchased the Essential Heating Strip and some of the Ph testing strips. The Heating Strip really is essential! I can't believe what a difference it made. Even though I live in a temperate climate, my house gets a little chilly at night and the heating strip kept the brew at a consistent 78 to 82 degrees for the entire brewing cycle. After about 9 days, I started the 2nd fermentation process. The blogs and resources Hannah provides on how to get the fizz factor going by doing a 2nd fermentation are wonderful. However… take her advise and "burp" your bottled kombucha early, or you might end up with a small volcano of fizz. I'm confident enough that I'm now trying the continuous brew method. Thanks Hannah!!! Yay! The heater saved the day! Now I have a happy and healthy fermentation factory under my bed thanks to the consistent heat this heater provides. Thanks for developing this technology! The strip is awesome. Completely changed my kombucha results. This is an amazing product!!! It works so well, and because it's so flexible it allows me to make small adjustments depending on the weather. It's been so cold here this winter it seems the cold is seeping through the walls and I'm able to keep my Kombucha happy!! Thanks K Mamma!! I am very pleased with the strip purchase- We keep our house at 62 at night, and 67 during the day, but it's a drafty heat. It makes a really thick milk kefir, and has made it faster to culture creme fraishe, and also kvass. At this time, I am not planning to use it for Kombucha because of the sugar content, but it's great for that extra heat boost. I did a lot of research before buying the essential heating strip from Kombucha Kamp. This product is the best on a market for warm loving kombucha culture. Hannah is a true kombucha mama, she knows the best how to take care of her babies scoobies. I am very happy with my purchase and so my scooby. It is getting plump, gives me beautiful babies and tasty kombucha faster. Success is always guaranteed when you are brewing with Hannah! I would rate it a 5 as it keeps the temperature of the Kombucha just right to work. Given that I live up North in cold wintery Ottawa Ontario, Canada, where we have witnessed several days in a row of -40 degree weather and blustery arctic winds, the heat strip has come in extremely handy to ensure my kombucha brew stays at a constant temperature. Before stumbling upon Hannah and the Kombucha Kamp, I was afraid to brew kombucha at home for fear of my SCOBY contracting mold due to cold temperatures. But with the heat strip, I don’t have to worry about the temperature of my brew dropping below the 21 degree threshold for mold development. I love the little rubber grippers on the heat strip which cling to my stainless steel vessel to be held in place. My SCOBY was not reproducing; I believed this due to cool temps. I live in SF Bay Area and the winter nights are a bit chilly for kombucha. I love this heating strip, it's perfect to keep the brew the proper temperature. I did need to use a timer though as the brew got to hot when leaving it plugged in all the time. The timer turns the heat on for 3.5 hours twice per day and that's just right for keeping my brew between 72 and 82. I brew in a 2-gallon glass jar, the strip goes nearly all the way around, leaving a small gap where I attached the included temperature strip to monitor the temp. This was a good investment that will help me to properly brew my bouch. I purchase the heat strip without the dimmer from Kombucha Kamp. Was a little skeptical at first. I had put it around my large water dispenser crock with the plastic spout. I left it just giving it a trial run a day or so. It warmed up very well, but when I felt it it felt too hot to the touch. So I placed it around a small jar like a fence and it began warming it up nicely. It made all the difference. I kept waiting for the small jar to get done so I could use it on the gallon jar I started on 2/7/15 thinking it wouldn\'t warm both. Well to my surprise I put it around both and it didn\'t go all the way around the 2 jars but it has kept both jars very cozy. I am going to like this heat strip. So if your thinking about purchasing one just do it they are great!!! The heater is working real well and we are drinking our Kombucha tea every day. Thank you. Scoby arrived fast and just as described and full of life. The taste could not be any better after that first brew. I highly recommend kombucha kamp and this product to anyone looking to make great homemade Kombucha. This is a great little heating strip...It really keeps the brew warm and happy. If it gets too warm I just move it out a little from the vessel and add a towel inbetween - very steady heat and great for the California weather in winter when it is in the lower temps. I'm a first time brewer, and wanted to make sure I did it right on the first try. After doing much research and knowing that my heat in my house is set at 62 degrees all winter long, I knew that I needed this heater (esp. since starting in January). This awesome essential heating strip brought my brew up from 62 degrees to 86 degrees overnight (rubber banded fully around my CB vessel, with a towel outside to insulate the heat). I pulled some of the heater away from the vessel (and still have a towel outside of the heater to keep the warmth in), and now have it set perfectly at 80 degrees. I have a beautiful 1/4 inch thick & 8.5 inch in diameter baby SCOBY only 7 days later...with amazing KT to drink. I used a KK SCOBY to start this brew. Thank you Hannah & KK for these amazing additions to my start-up system!! I purchased the warming mat after I had trouble keeping my kombucha warm. I live in southern California, but my house has been about 65 degrees during the winter. Since using the mat, I've had THE BEST kombucha! It ferments quickly and tastes great! My only complaint is I should have gotten the dimming mat since if I'm not paying attention it can get up to 85+ degrees. I do put a towel between the brewing vessel and the mat to help. I've purchased several Kombucha Kamp products and they never disappoint! My husband, bought me a Jun culture and heating pad for Christmas...just what I wanted. Love this thing! I live in Texas, which is generally warm, but in the winter time, the highest we put our heater on is 71 degrees. I wanted to get my brew started right away on December 1st, so I bought this and it works like a charm. It fits snugly around my 2.5 gallon container and I don't have to worry about leaving it plugged in all the time because of the design. Prior to having this heat strip it was impossible to keep the temperature in the desired range. Adding this strip fixed my problem. Since then I've added another gallon jug and it continues to keep the temperature in the perfect zone. It is wonderful. this works great! Never have to worry about the temp in the house anymore. keeps my kombucha at the right temp! This heating strip is wonderful! I don't have to worry about my Kombucha getting cold in the winter. In the warmer months, I can simply plug and unplug as needed. Well worth the money! Everything I've ordered from Kombucha Kamp has been excellent quality and I've received it quickly. Thank you for providing a superior product! I was a little disappointed when I pulled that small heat strip out of the box. But I must admit, it does the job well. Easier to time your Kombucha harvest when ou know it's getting the heat it needs to grow. Hannah gave me great advice as to which heating strip I should use for the climate I live in. She could have said the more expensive one, but she did not. This heating strip works perfectly and I am finally growing baby SCOPYS again. Hoorah. If you live where the temperature drops in the fall and winter, get one of these if you want to keep your Kombucha brew kicking along. As the temperature drops, the brewing process takes longer, and once you taste this great stuff and want to sip and brew regularly, you will -- if you're like me -- get frustrated by having to wait when the temperatures start cooling down. Might be worth buying a couple of extra temperature readers (they're reasonably priced) as back-ups when you purchase the Heating Wrap. I half wish I'd gotten the other one with a digital thermometer. So far I am very pleased with the kombucha heat strip. Nine months out of the year out house is not warm enough nor do we have a place where the temperatures are warm enough to brew the kombucha. This heater is exactly what I needed to keep my brew at a constant temperature and speed up the fermenting process! Before I received the heating strip, I had inconsistent brew times and tried various methods, such as a light bulb, to keep the brew warm....all to no avail. I HIGHLY recommend the Essential Heat Strip; it surrounds my gallon crock with gentle, even heat and has made all the difference in keeping my KB consistently happy and delicious! This is the coolest, most brilliant thing EVER! I love that its flexible and wraps around the container, requires very little monitoring, and keeps my brew at a pretty constant temperature. I'm thinking I should have gotten the version with the dimmer, but I'm over-the-moon happy with this one! Brilliant!! This strip changed the way I continuous brew forever! My house is kept very cold and my ferments were taking forever, this strip has been a game changer and I'm producing booch like never before! I thought I didn't need this because my brew was a constant 74 degrees without. but my flavor was off and hannah suggested more heat. I absolutely love my heat strip! It has made a world of difference in keeping my kombucha brew at just the right temperature. The temp control will be perfect as the weather warms up and I need less heat from the strip. My kombucha comes out perfect every time. Thanks! I am loving my heater. It works very well to keep my new at the right temp in my cool kitchen. I plug this in every night and turn off every morning. Have perfect continuous brews!!! Did exactly what I wanted - happy mothers made happy SCOBY babies and speeded up production. Love it. I live in the Northeast and it would be impossible to keep the brew at the right temp. The heater is wonderful. It took me a day or so to set it for the correct range, but it was smooth sailing after that. Great product! It's perfect - just what my scobys needed! My sluggish brew - 10 days - became a hotshot - 3 days, with the warmer. Sitting right next to my hotel, the hotel started filling up. Instead of 1 mother and a couple of tiny babies, within 2 or weeks I had 5 big healthy mamas to share. I like using the heating strip.I had to put a towel folded between the continuous brewer and the strip to keep it in a 72-80 degree range. I am getting a batch of kombucha every 3-5 days. YUM! I've got two batches brewing at a time now--one with the heating mat and one without. The heating mat definitely cuts down the brewing time. It's easy to use and it heats the brew gently. I'm giving the heat strip 5 stars b/c it did just what I wanted it to do. My house temperature dips down in the evenings. My brew was taking about 8-9 days to get to where the sugar is just vague & the tartness is not overpowering. I think though, that I was stressing my scoby at night with the temperature fluctuation b/c it was not reproducing. Since using the heating strip, I now have my first baby scoby. My continuous brew takes only 5 days now. I am only using the heater at night & this seems to work fine. I very much recommend this product. Thank you Hannah for being so helpful & for all the info you provide on your site. Love your warmth, friendliness & personal service. I wasn't sure I would need this, but I am so glad I got it. When I first got it, I had to play with it to get my kombucha to the right temperature. I actually may order another one because I think I need one for my bottles that I keep in my closet for the second fermentation phase. The closet gets cold, and I think this may be exactly what I need! Excellent and easy to use! I highly recommend this item! I've now used my heating mat through several cycles. It works well, and seems to make the brewing process faster (I am a batch brewer). In the winter, my kitchen tends to be cold and drafty, and this mat routinely keeps the jar temperature between 76 and 78 degrees. It seems to require very little monitoring, and is certainly a good choice for the changing seasons. I ordered Hannah's essential heating pad for my kombucha. Her service is soooo prompt. She gets your order in the mail right away. The heating pad is working great. It raised my Ktea temp from 70 to 83. Thank you Hannah for creating thi­s wonderful product. As a first time brewer this heating strip (along with the thermometer included in the package) were fundamental to the success of my first brew! Knowing that my brew was happily kept at the ideal temps (especially through some chilly nights!) allowed me to leave it alone for the first 7 days - and it came out great! If you don't have this heating strip already, you are missing out. It is a huge help to the brewing process! I purchased the Essential Heating strip to easily reach the optimum brewing temp. It worked and ordering from Kamp saved me time and gas. I heat 4 containers with this item. All I can say is: what a great investment. Our winters range from 30-60 degrees so this heating strip is getting a lot of use during the nights. There is NO question that it has helped produce carbonation more quickly AND applying heat to my fermentation jars causes the kitchen to smell of yeast! Yummy! Will be ordering another soon. Worth every penny. Life saver! I just bought this heating system for the winter months here in Portland OR and it's working beautifully! My house is at about 60 degrees constantly right now and my kombucha is reading right at 82. Perfect! Thank you. Living in Southern California and starting to brew in the summer, you wouldn't think I needed this, but boy, I'm glad I got it! The temperature strip is invaluable, because I didn't know why my first batch got so vinegary when I had it wrapped with a heating pad... Lesson learned! :) But now I have a continuous brew set up and it's always perfect because I can keep an eye on the temp and KNOW if it's too hot or cold. So far, I just set the strip loosely towards the top of the container and plug it in only when it gets cooler, but I expect to get it plugged in longer now that the weather is cooling off. Thanks so much!! Love the heater strip. It is simple to use. Although I live in a warmer climate,the nights can get cold and I simply put the heater on for an hour or two to warm up my kombucha. Love it! Especially that it is flexible and can wrap around and heat several vessels. Temperature really makes a difference to my brewing! I ordered the heater strip with my complete package. So glad that I did. I live in northwest Florida where we do have a slight change of seasons. This year we have had the wettest weather in over 50 years for four months in a row making our summer temperature cooler than normal. I put the heater around the brewer under the tee set on day three which speeded up the brewsing process. The heater allows the brewer to stay at an even temperature. Be sure to get one! I live in SF, so it's basically 60 degrees all year. It was just a little too chilly for my kombucha. It was fermenting, but not quickly enough for me. This heating pad has solved the problem. The day after I started using it, there were bubbles galore in my batch. And now I don't have to wait 2 weeks for perfectly tart kombucha! I love that the strip wraps around easily (I keep it snaked around two jars), and it never gets hot to the touch--just warm. Perfect! This heater was perfect for cool Mi nights/winters. I found this one fit perfect around my modern porcelain continuous brewer and under the tee set. Great product! The heater really isn’t necessary in Arizona’s hot summers, but I use it to bring my tea back up to temperature when I refill the continuous brewer with sweet tea from the fridge. We let the temperature drop at night in the house in the winter so it’s nice to have the heater to keep my tea warm. We go through Kombucha so quickly that I keep the scoby at ideal temperature 24x7 to keep up production for our family of 4. I only use it about an hour at a time so it doesn't overheat the tea. This is great! It is still very chilly at night here in Colorado and will be a must in the winter! So far so good. Bought a light timmer to plug the heater strip into and my brewing pot stays around 80. Heater strip looks to be of good quality and I hope to get years of service from it. This is a nice product. The heating system works great. But I find it difficult to read the recording temperature in the thermometer strip that comes with it. This heater helped my process immensely! Made my kombucha turn out perfectly. Great product! I purchased the Essential Heat Strip because it was recommended to me by a friend. I received my product quickly and safely, and now enjoy fresh buchy daily instead of waiting weeks between batches. I am able to brew easily to our family preference of tartness. I would like to encourage everyone to invest in this strip and start enjoying the speed and convenience. The heating system has been great for keep my CB warm this winter. I usually kept it on at night and it kept my kombucha toasty warm from 74-82 degrees. I live in southern california so it's warm here often. However, it is usually pretty cool in my house so I decided to order this heating strip. It has been so great! I would recommend this product to everyone who needs to warm their kombucha up about 10 degrees. I swear it has made each batch better and helped it to mature quicker. The scobys seem so happy and I'm happy with my tea! I use it on the porcelain continuous brewer and it is immensely helpful. Love this site and all the products!! My beginning kombucha brew had been struggling along for over a month here in the central California coast and was just beginning to have a tart-ish taste. The "winter" here is relatively mild, but even so, when I was able to measure the temp with the monitoring strip provided, it registered at the bottom, so could have been even lower than the lowest range, which was 64 degrees. I bought the smaller heating strip and it has proven to be quite adequate. I'm brewing continuously in a 2 1/2 gallon jar and when I remember to keep it plugged in after borrowing the plug space for other appliances, it stays right at about 80 degrees. My kombucha seems quite cozy and happy now. Thank you for the valuable service you are providing, Hannah. Wishing you many blessings and much success. I've been using my new heating belt for a few days now, and it works great! I'm very happy with my new purchase. I set it up on a timer, as it really does get quite warm, even here in chilly Montana. It's February in Denver, CO so I knew I would need a heating strip to correctly brew my kombucha. After exactly 1 week, my kombucha brewed perfectly (nice and tangy, not too sweet). Wouldn't have worked without this heating strip! Brilliant! My tea had a starting temp of about 62 degrees, and after a few hours with the strip, it was still in the mid 60s. (It was a large brew - I think I didn't wait long enough). So, I put it on a heating pad for about an hour, brought the whole thing up to the mid 80s, and the heating strip has kept it there for the past four days. Our house is kept in the low 60s, so this is a good 20 degrees above room temp. For the next brew, I think I'm only going to use the heat strip at night. Yay! I've had this heating strip for almost a month now and I am sooo pleased. I got the smaller one without the temp. control, but it gives plenty of heat for my 4 liter glass jugs. My house is about 65 degrees in the winter and even cooler at night because we turn the heat way down. The temperature strip that comes with it makes the system work wonderfully. No more messing with thermometers. You can always tell what temperature your kombucha is by just looking at the strip. If it's a little on the too warm side, I just loosen the heater around it and if it's too cool, I just wrap it a little tighter. Works perfectly and I'm have much more success with my brew. After many unsucesful winter attempts, even in San Diego, my KT mat is the best thing for keeping the tea brewing at the perfect temp. It is a great invention! This produce does what it says. I live in the deep south so I do not get too cold here. It works best for me to leave it loose and not bound tightly to the jar. I bought this heater to use with my gallon glass containers and it's working extremely well! My SCOBYs are happy and my KT is perfect. I also bought the year round heater for my continuous brew vessel and love it as well. Both are high quality and easy to use and I'd highly recommend them. This heat strip is a booch a life saver! It can get really cold in the winter here and my booch is kept warm and healthy using this heat strip. Love it! This is a great product! I live in a house that is kept cold because I have a very hot natured husband. If it's summer, the thermostat is kept at 70 or below. If it's winter, the heat is set at 65-68. I don't have the continuous brew system so I have several jars of little trooper mushrooms shivering and struggling to grow. In spite of our cool house, they still do; just a little slower. So I have been able to speed up the process of mushroom growth with this wonderful heat strip. I can see a very noticeable difference. What a great invention. Thanks. A must have for worry-free brewing! After trying too many different (ineffective) ways to keep things warm enough, we found this heater. Wish we would have known about it sooner! It's perfect for the continuous brew method, too. This heater is perfect! Our kombucha was definitely not loving the winter weather. It was taking so long to get to the right flavor and carbonation. As soon as we got this heater on it, it's PERFECT. And it even looks happier. Thank you so much. I have ordered two heat mats since starting to brew my own Kombucha a few months ago. 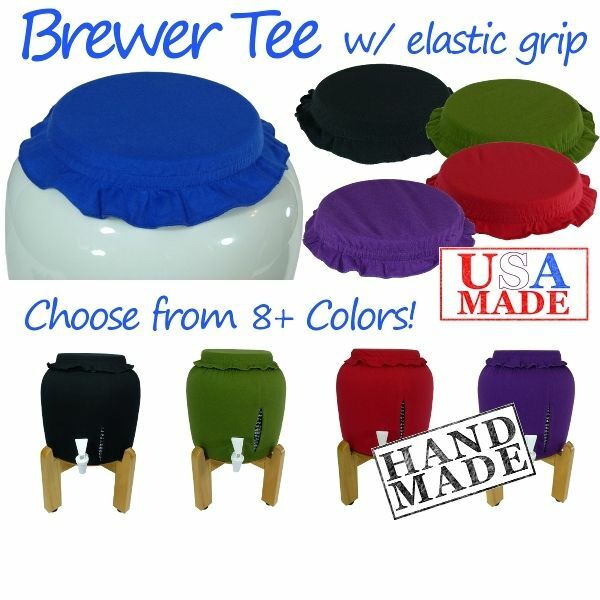 I use one for my brewer and one for the 2nd fermentaion. I live in Wisconsin where the weather can be quite cold at times. The warmers are wonderful and really the only way for my kombucha to brew at the moment. Far better than trying to use seedling mats or beer brew belt. I completely underestimated the strength of that heater! I left it on for about three hours once the KT had cooled, and when I checked the temperature, it was up to 86F! (I immediately unplugged it and plugged it back in once the temperature got back into the low 70's). I have it on a timer right now, and it's been doing a fine job at keeping the container somewhere between 72 and 80. The KT is obviously very happy--I can see bubbles just underneath of the new scoby that's forming! I swear, I think the new scoby grew another cm today alone! It's really a great little heating strip! I have no idea what I would have improvised with, otherwise. You guys have a great product, and amazing customer service. Thanks again for your help! This heating strip is wonderful; made a big difference in my chilly Ohio house. Our brew after receiving the strip was indeed potent as we likely brewed a bit too long. Current brew is going oh so well after 11 days and ready for bottling! This works great_Perfect for my kombucha. But I have found other uses as well. In winter it also takes my kefir longer to ferment. I found it works well to speed up my kefir ferment. Today I am soaking my split peas. Split Peas and lentils should be soaked at a warm temperature to help get rid of the phytic acid. Once again my KT heater to the rescue! This heater is FANTASTIC! There is no way my brew would succeed without a heat source and I am NOT going to put my Continuous Brew System on top of my refrigerator (for the heat)! I especially like how easy it is to control the temp (the thermometer is essential, too) so I can keep my brew from getting too yeasty. Thank you, Hannah! I live in Florida which gets cool in the evening. I purchased the heat strip that has no Thermostat . I plug the strip In when I go to bed and unplug in the morning and it keeps the temperature at the correct level. Works very quickly, Very satisfied with this Heat strip. I also purchased some of Hannas tea blend, It's off the chain whether in making kombucha or just having a morning tea. Great job and I love your products Hannah!!! If you want to do kombucha year round, this is an essential piece of equipment. i keep my house at about 70, and this warms it to a nice, consistent temp. we use it almost 6 months of the year. no complaints. It gets chilly at night here in the foothills, even in the summer. I put the strip on a timer and it keeps my brew the perfect temperature through the night. My scoby is happy and the brewing time has been reduced! Well worth the investment. Living in the Great Northwest, just under the clouds of the Olympic Mountains, a heating strip is like having an umbrella or two stashed in the car. The heating strip turned my barely brewing batches into "Oh my God, there's a Scoby on top-I can do it!!" I took the plunge and purchased the deluxe heater with the dimmer switch. I'm glad I did. I can't imagine using the standard version without any temperature adjustment control. It is also very precise. I have it set at 78 degrees and it stays there all the time. I also have the heating strip and am so glad I got it. In the past, I worried that my kombucha would be damaged by the cold in the winter. Now with the heating strip I never give a thought to the cold. Wonderful! Your heater works great, wish I would have spent the extra money and purhcased the one with a thermostat. I had to put cloth between the glass and the membrane to keep from over heating. got up to 95 degress very quickly. On a crock it probably wouldnt have done that. But on a thin glass jar it got suprisingly hot. Quickly! I have just started brewing Kombucha and realised that I needed a heater. I had read about heating trays, but someone said they weren't reliable and only lasted for 6 months. I bought a small heating strip from this site and I have to say I have now made the most delicious Kombucha. The weather here in England is very cold this time of year and I found that putting some insulation around the strip helped enormously. I am using the continuous brewing method so I need the extra heat around the 9 litre container. In short I have found a method that works even in the coldest weather. The heating strip is very useful too and with my small heating strip and insulation I am well away. I thought that maybe at a later stage I might buy the larger size heating strip and use the small one for brewing smaller batches which I can then use to experiment with different taste. As a Medical Herbalist I appreciate all the special qualities of Kombucha, in particular one which I feel is very important to health and that is keeping our blood pH in the correct range (7.35 - 7.45). If anyone wants to test the efficacy of Kombucha then test your urine's pH while taking KT and when not taking it. Best wishes - this is one of my favourite sites and 'does what it says on the tin' ie provides a good quality product, service and a place to go for advice. I noticed during the winter that my kombucha seemed to linger at about 70 degrees and was taking longer than a week to brew. With the essential heater affixed very loosely my brewer now sits at about 78 degrees. If I tighten it goes a good bit higher, but I'm only brewing a little over a gallon at a time. I'm sure it would work very nicely on a larger system as well. This heater did the job on my Kombucha. I use it for other ferments now too. Nice job. I ordered the heating strip with my continuous brewer but had no use for it yet as it was still warm. Now that the temp is starting to drop at night I mostly just turn it on when I go to bed and then off in the morning. It keeps the temp perfect. I liked the previous reviewer's idea about a timer. I also like the thermometer that comes with it. I'm in California so I may not need to use the heater all day. This heating strip is perfect for my area! I ordered this a few weeks after I ordered the CB - should have gotten them at the same time. This heater is great though - very powerful and it comes with a little thermometer so you know if you should turn it off for awhile. I'm thinking about getting a little timer for it and just having it run at night. Nice heater! Picked this up for my jar set up and it works great. I use it for two jars and wrap it around like in the video and it stays toasty warm. Might have been better off with the other one with a dial but this one gives plenty of heat. Probably going to get another one for the winter. I bought the heating strip to keep my brew at a consistent temperature and I noticed a difference right away in the time it took to taste right. Thanks Hannah! Having started my cb in july, in Ga had no need for a strip but ordered one on the off chance I would need it. Having said that I noticed when the temp outside dropped to the 70's and 60's my brew seemed to slow done and almost stop maturing, was just to sweet. Remember I had the strip wrapped it around my container and it warmed right up and began producing again. Great strip, easy to use and really does the job. Worth while investment, get it you just might need it. I am so happy with this heater! We live in Cleveland and the climate isn't exactly 65-82 degrees year round! We were having some problems with mold growing and Hannah suggested it might be because it's not being kept warm enough. Using the heater, we've been able to brew the happiest, most potent kombucha yet! Thanks Kombucha Mamma! !